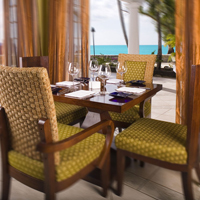 In the Cayman Islands, dining at Hemingways by the Sea is a true culinary delight. Known for serving the very best seafood, dishes like the seven spice breast of duck are also the reason it continues to be one of the top-rated restaurants in the Cayman Islands. Hemingways’ chefs have a passion for food. Hemingways also features an extensive wine and cigar list. Indoor and outdoor seating is available.